← Raised cedar bed kits — at the hardware store! 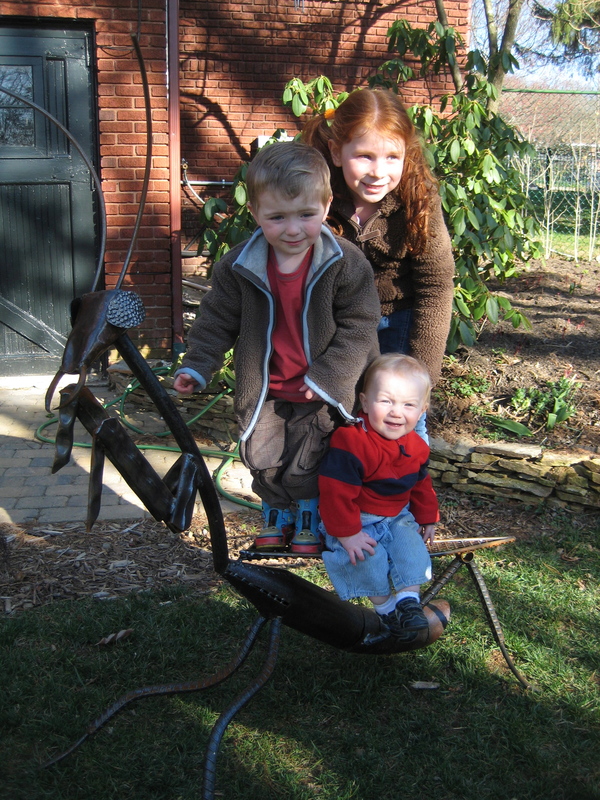 We have had a large metal praying mantis sculpture in our yard for a couple of years. Now we have about 500 of its real-life counterparts inhabiting our garden, thanks to an early birthday present for our 5-year old from our good friends. It’s definitely a great gift for a 5-year old boy — but I must admit I was as excited about it as he was. 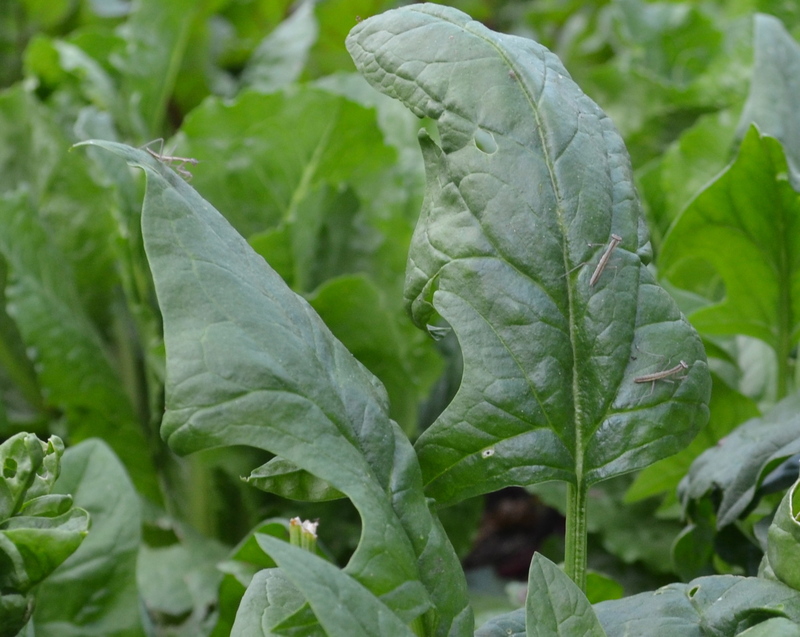 I’ve always heard that praying mantises, like ladybugs, are great predators for garden pests, eating all kinds of caterpillars and grubs that like to mess up good things growing. 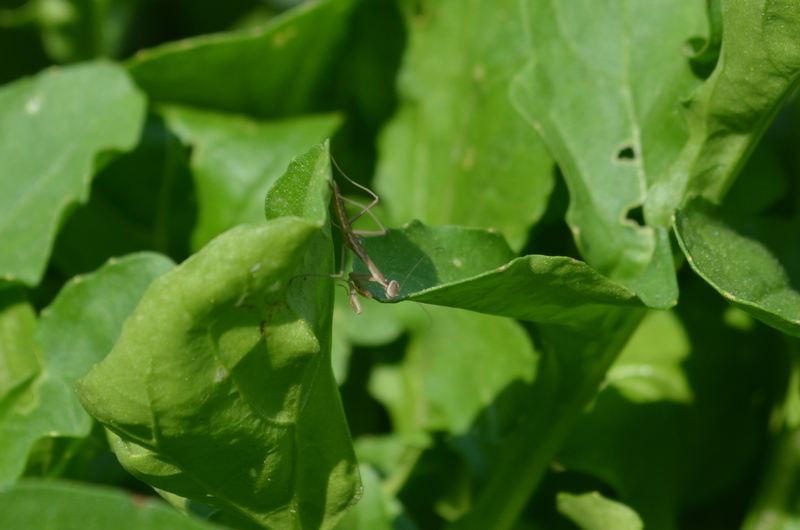 We’ve also captured praying mantids in our house a couple of times and watched them for a day or so, and have been amazed at their lightning-quick forelegs and voracious appetites for moths. This excellent birthday present was 2 egg cases, which the container said held approximately 200 baby mantids each. The container also said it would take 2-6 weeks for them to hatch — you could put the egg cases outside in a tree or bush. We all ran outside (after our 3 year old fell down the stairs in the midst of all the excitement — poor guy), my birthday boy unscrewed the lid and we watched them hop fearlessly from the glass to the green arugula and spinach leaves. They were a tiny army — and a thirsty one at that, as they each immediately stuck their faces down onto the leaves to drink the dew from the night before. 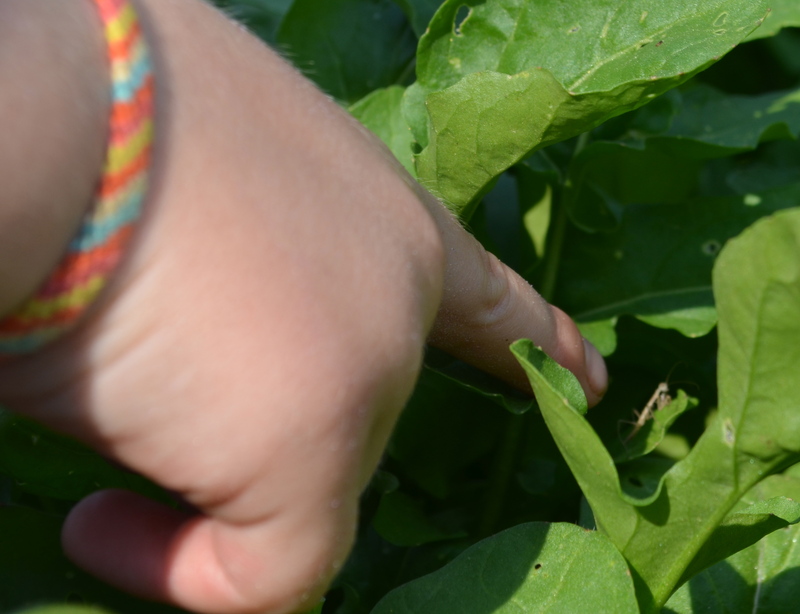 We checked on the mantids after I picked the guys up from preschool at noon, and we found many of them perched on the tops of leaves in the garden, waiting for their next victims. I’d put both egg cases back into the jar as I couldn’t tell which one was the one that had hatched. Thank goodness. 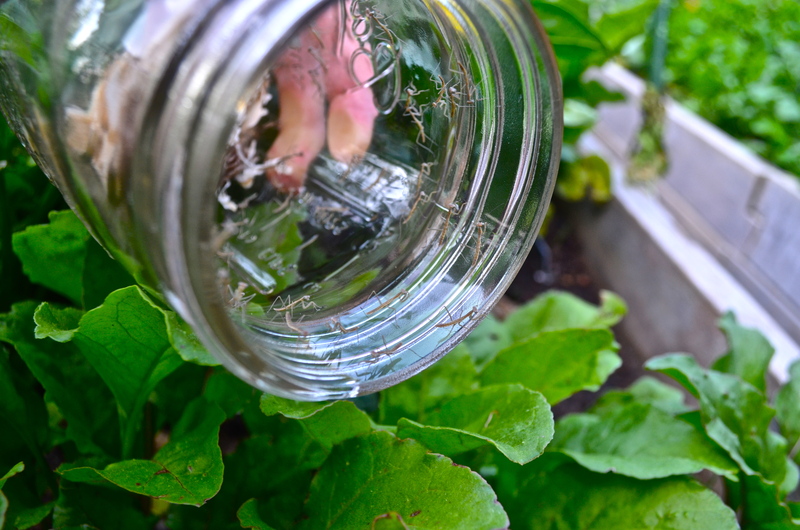 Two mornings later, I came downstairs to find another jar full of baby mantids raring to get out. 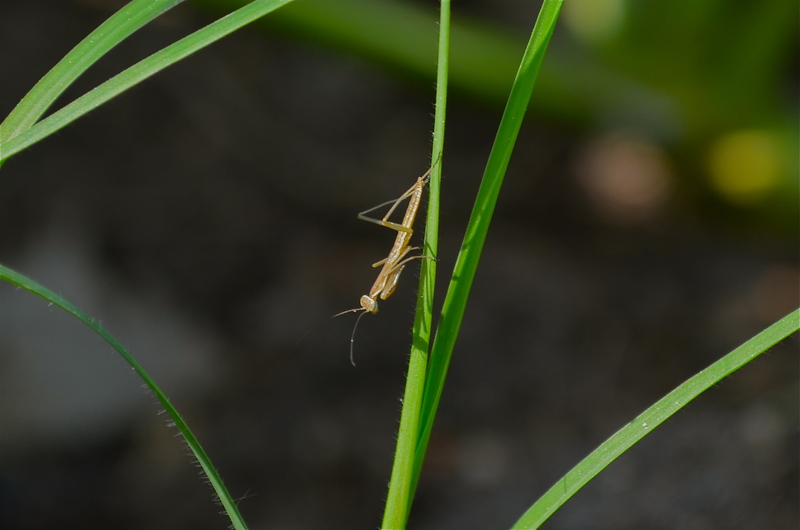 I thought maybe the raised beds in the front yard had plenty enough pest protection from the first release of mantids, so I dispersed the second hatching onto the plants in our perennial garden in our backyard (including on our apple trees, blueberry and raspberry bushes). That is so cool! 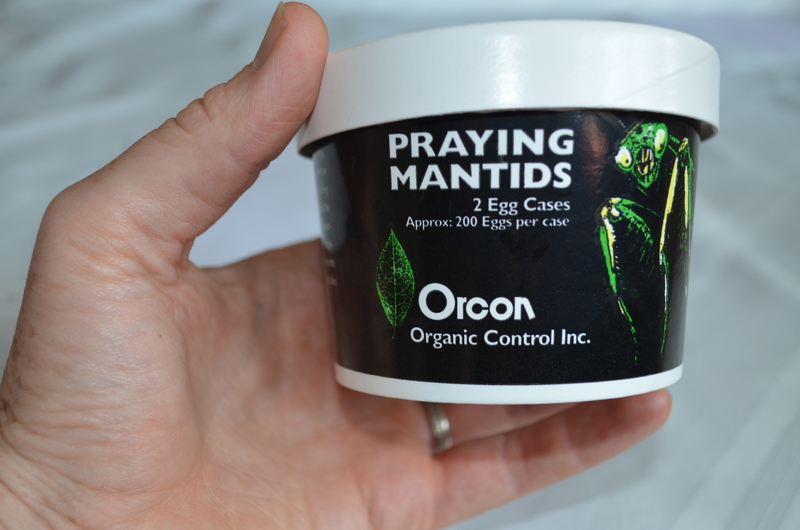 Where do you get the mantis egg cases? I have always loved mantids. I am not far from BB Barnes. Thanks for the info! What a great gift and gardening education for your 3-year old. That would be so much fun to do. Looking foward to meeting you in Asheville next week.